Hello my fellow vise loving friends. My wife doesn't really seem to appreciate old iron like I do so i thought I would share with the forum. Check out this beauty I picked up today. 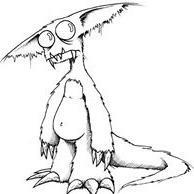 A Reed 106 weighs 133lbs and has 6inch jaws. I put the old can in there for a size reference. This vise makes all my other vises look like babies. I think the Rock Island I got yesterday could fit in its jaws. The old chipping vises were massive and designed for heavy working on them. Yer gonna love it! My 8'' Parker is something I use alot, for grinding, tapping holes and such. Having a vice that's mounted say a foot lower than your post vice is a nice addition to any BS shop. I got a very large Reed mounted to platen table I bought for scrap prices. The handle was missing, the jaws were frozen, and the locking screws for the base are seized. I made a handle for it out of 1" round rod and got the jaws freed up. I never did get the locking screws freed up. I think that thing weighs well over 150 pounds. that is sweet ! 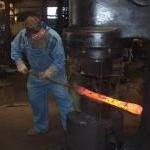 i had a thing for vices way before blacksmithing ! 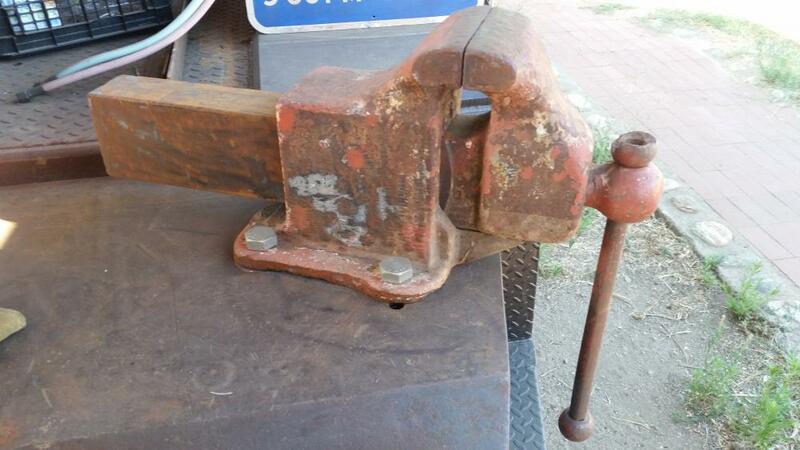 I got a friend a deal on a massive old shaper vise---they loaded it with a forklift. The sort of thing where you don't need it very often but when you do *nothing* *else* will do! Nice vise. 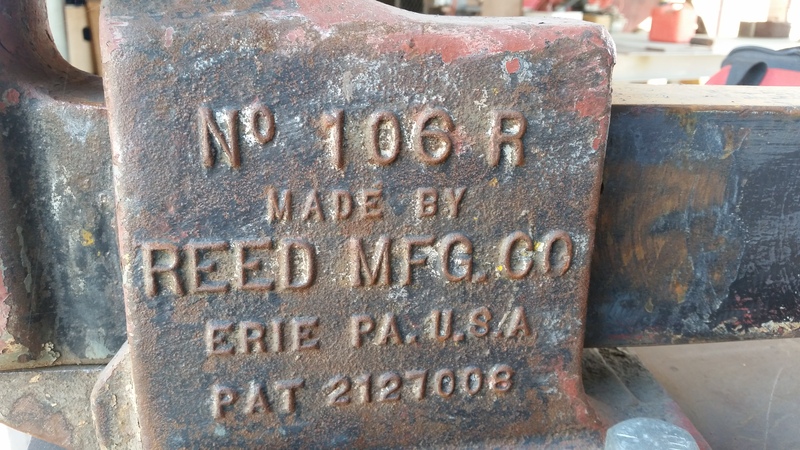 This vise was made in my original home town of Erie, Pa. What is cool is that they are still located there (use to ride the schoolbus pass the ivy covered brick building daily) and I believe continue to mfg. "heavy duty" vices in the USA (although some of their "economy" vices are made in the far east). I've got a Reed 105 out in the shop. The 106 looks good! Of course the patent date doesn't necessarily indicate the manufacture date. It's just "After 1938". Now if you can find a real Reed Vise Boffin they might be able to tell you when they stopped making that model and so pin down the range. Note quite, but that was the common theory for years. Recently, a bunch of guys did a lot of research based on a thread on another forum, and with hundreds of examples to go by, figured out the specifics. The short version is that if the key isn't stamped with "GUAR EXP" and a date, the vise was manufactured during the month/year it was stamped. Only vises with the GUAR EXP and a date were made five years prior to the date stamp. It appears that the 5-year post dating started in late 1954 and ended in 1960. Vises built from 1941 to some point in 1945 had no date stamp at all, so the earliest date stamps will be 1945. The other thing to note is that the date code isn't necessarily when the vise was cast, it was when it was completed, and released for sale. Some models were cast in very large lots that took decades to deplete. The most commonly seen examples are the 2" jaw baby models. Almost all of them were cast in Chicago, but we've seen examples with date stamps on the slide going well into the 1980s as I recall. All of them that I've had were stamped in the 1960s, long after Wilton left Chicago in 1957...they must have hauled a lot of them from Chicago to Schiller Park! I'm going to publish an article on this on my website soon...the question comes up all the time, so it'll be nice to have a ready reference for folks. On the Reed, the patent was for the split collar and adjustable nut stop that lets you adjust all the lash out of the spindle...it's a great feature. Yours was probably made no later than the 1950s because the very last run had replaceable jaws and ended in the 1960s...going off memory. You have one of the absolute best 6" vises ever made...I'd love to have that one! Please post that article on IForgeIron also. Great reference material. What did the patent say when you looked it up?